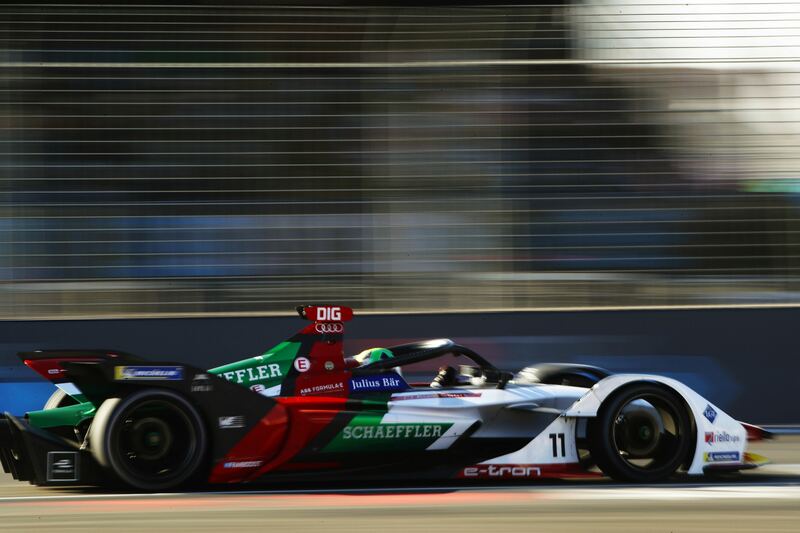 Lucas di Grassi has taken pole position for the Santiago E-Prix, beating Sebastien Buemi and Pascal Wehrlein by over half a second in a dominant display, but is under investigation and could yet lose his front row slot. 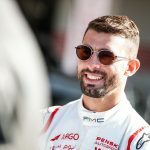 Group one featured the top five in the championship, headed by Marrakesh race winner Jerome d’Ambrosio along with Antonio Felix da Costa, Jean-Eric Vergne, Andre Lotterer and Robin Frijns. After waiting in the garages for a couple of minutes following the green flag, Frijns was the first driver to venture onto the Santiago track and attempt to reach Super Pole. While the Dutchman put in a banker lap, d’Ambrosio turned it up to full straight away and wrestled his Mahindra into a benchmark time of 1:10.083s, having made a slight error at the penultimate hairpin. Lotterer also went for his 250kW lap straight away and took P1 with a 1:09.485s while da Costa took P2. Not long after, Vergne then stole away the fastest time as the Frenchman set a 1:09.307s while Frijns took third, shuffling da Costa and d’Ambrosio down to fourth and fifth. The second group of the session featured Sam Bird, Mitch Evans, Alexander Sims, Sebastien Buemi and Lucas di Grassi, who currently occupy positions six through ten in the drivers standings. Once again it was a little while before any of the five drivers made an appearance, but Sims broke the silence with just over three minutes to go, then followed by Bird and Buemi. While others went for a banker lap, di Grassi went for his 250kW lap straight away and despite a lock up in the final sector he set a time of 1:08.842s to provisionally go fastest. Evans briefly went into P2, before it was stolen away by Sims. Bird then took P2 for himself, but the final driver of the session, namely the previously stricken Buemi, smashed in a 1:08.664s to take the fastest time of qualifying so far and meaning all of group one were unable to reach Super Pole. Group three was formed of Oliver Rowland, Daniel Abt, Nelson Piquet Jr, FP2 pacesetter Jose Maria Lopez, Maximilian Günther and Oliver Turvey. Piquet was first of the group but a scruffy lap which included a lock up into the hairpin saw him go P10, while Rowland just missed out on a provisional Super Pole slot with the seventh fastest time. Lopez wrestled his Dragon and looked set to challenge for the fastest time of the session, but could only manage P5 before teammate Günther proved the potential of the car with the fourth fastest time. The fourth and final group fielded Edoardo Mortara, Tom Dillmann, Stoffel Vandoorne, Felipe Massa, Gary Paffett and Pascal Wehrlein. Mortara provisionally went into P6 and Super Pole, while teammate Massa took P8. Vandoorne put in a great lap to book his place in Super Pole with fifth place, while Dillmann made a mess of his lap and took the 21st fastest lap, before being shuffled down to last as Paffett went into P17. These top six advanced into the Super Pole shootout, with Abt the first to tackle the increasingly-hot track. A soild lap from the German set a benchmark of 1:08.958s, half a second off the fastest time of the group stages. HWA Racelab’s Vandoorne was out next looking to build upon his fourth place start in Ad Diriyah. The Belgian set a purple first sector but was unable to keep the pace and lapped 0.277s behind Abt, and also came under investigation for an infringement in the Super Pole procedure. Marrakesh pole-sitter Bird then made his way onto the track in search of his sixth career pole position. After matching Abt in sector one, he went purple in sector two but a scruffy hairpin in the final sector left him lingering in provisional third place. Only the last three remained, with di Grassi taking aim at his fourth pole position in the series. The Brazilian sailed into provisional pole with all purple sectors, lowering the benchmark to 1:08.290s, faster than Wehrlein’s time in the group stages. The penultimate driver was Buemi, the current record holder for pole positions in the series but in search of his first for Nissan. The Swiss lapped half a second off the pace of di Grassi, but still took the second fastest time with only Wehrlein left to run. In only his second E-Prix start, Wehrlein made his case for his maiden Formula E pole position after setting the fastest time in the group stages. He ran close to di Grassi’s time, but ultimately fell short and took third place between Buemi and Abt. While di Grassi took provisional pole, he could be under threat due to a steward’s investigation for a suspected technical infringement, while Vandoorne is also under investigation for not respecting the Super Pole procedure. 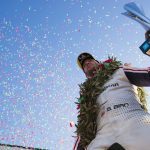 If di Grassi loses his pole position as a result, it will promote Buemi to his 12th career pole position and first for Nissan, while Wehrlein will take his first front row start in only his second E-Prix. Championship contenders d’Ambrosio, da Costa and Vergne will provisionally start 21st, 18th and 13th respectively.